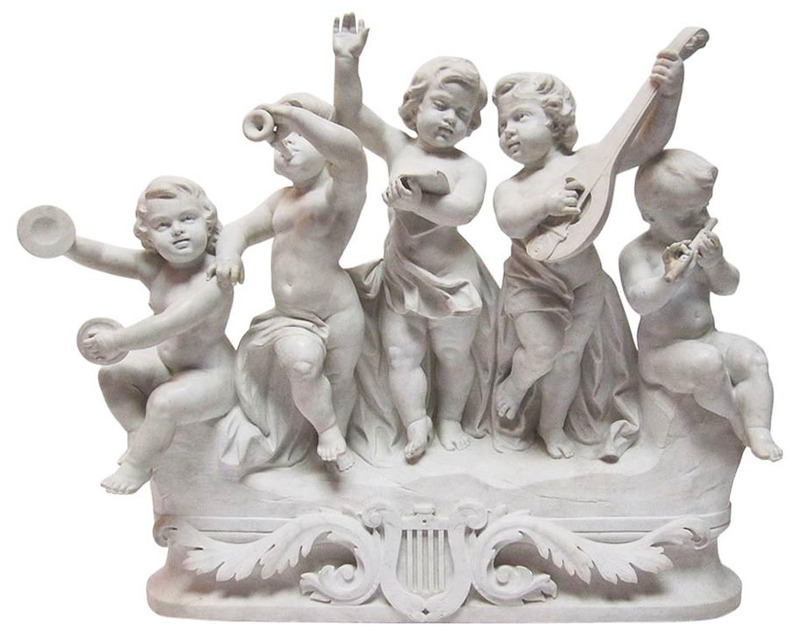 A Very Fine and Large Italian 19th Century Carrara Marble Group "Allegory to Music" Depicting five Bacchic Putti musicians playing various instruments. The finely carved Palatial Group with five children, the three center ones standing while the two at each end sitting on a rock, four of them playing cymbals, trumpet, mandolin and while one in the center reading music. This very sweet and charming group is one if the largest group of this subject ever offered by us. The high quality carving of the artist, gently capturing the emotions and artfulness of their repertory, make this one of the finest marble groups of it's kind currently available for sale, a true Master Piece!. Signed: Luisi. Circa: Florence, 1880/1890. There is not that much information available about the Italian sculptor Luisi other than he worked in Florence at the end of the 19th century. He is known for his allegorical marble groups of children as well as classical sculptures of works after Canova. Another smaller group similar to this one but much smaller also by Luisi was sold at Christie's in Melbourne on 8-9 April, 2003, Sale 1037, Lot 270.